Singapore has used commercial shipping lines to transport military vehicles and equipment overseas for decades as that is the most cost-effective and efficient method, said Defence Minister Ng Eng Hen yesterday. It is the norm for militaries to use commercial carriers to ship equipment or vehicles for peacetime training. Many defence companies also do it to deliver hardware to customers or for exhibition displays, he added. "Only commercial carriers and their vast network of inter-connected ships and ports have the capability to transport heavy vehicles around the globe," Dr Ng told reporters during a visit to Choa Chu Kang military camp. He was addressing the detention of nine Singapore Armed Forces (SAF) armoured vehicles in a Hong Kong port. The Terrex Infantry Carrier Vehicles and other equipment were being taken on an APL vessel from Taiwan to Singapore after a military exercise, when they were seized last Wednesday. The carriers that we had appointed before had used Hong Kong frequently without any incident. DEFENCE MINISTER NG ENG HEN, noting that there was nothing unusual in APL using Hong Kong as a transit point. Only commercial carriers and their vast network of interconnected ships and ports have the capability to transport heavy vehicles around the globe. DR NG, on why commercial shipping lines have been used to transport military vehicles and equipment overseas for decades. Until the facts are established, any speculation is premature, unwarranted and I think indeed unfair to the Hong Kong authorities or any other countries. DR NG, on not speculating about why the armoured vehicles were detained. Before the incident, the SAF has not "suffered any loss or detention of our equipment", Dr Ng said. The SAF conducts overseas training in about a dozen territories abroad, including the US, Australia, New Zealand and Taiwan. Asked if there were concerns of any sensitive information on the Terrex vehicles that might have been compromised, Dr Ng said the vehicles did not contain any controlled military items that would require a specialised and dedicated means of transport. In a separate interview yesterday, Chief of Army Melvyn Ong also said the APL shipment did not have any sensitive equipment or ammunition - only combat vehicles, radios and small arms. APL has shipped SAF military equipment since the 1990s, Major-General Ong added. Dr Ng noted that many shipping lines carrying the military equipment of various countries call at the port of Hong Kong. There was nothing unusual in APL using Hong Kong as a transit point, he said, adding: "The carriers that we had appointed before had used Hong Kong frequently without any incident." When the SAF appoints shipping lines, they are given specifications of military equipment so they know what they are carrying. The contract terms also state clearly they have to comply with international and port of call regulations, Dr Ng said. "It is their core business to understand what the rules are, to apply for permits or to comply with the regulations of each individual port." Last Saturday, a report by Hong Kong's FactWire news agency said the APL container ship had docked in Xiamen in mainland China before transiting in Hong Kong. The report said the Hong Kong Customs and Excise Department was tipped off by its mainland counterparts about the nine SAF armoured vehicles, leading to their seizure in Hong Kong. It also said APL did not have the "approval notice" for military vehicles. 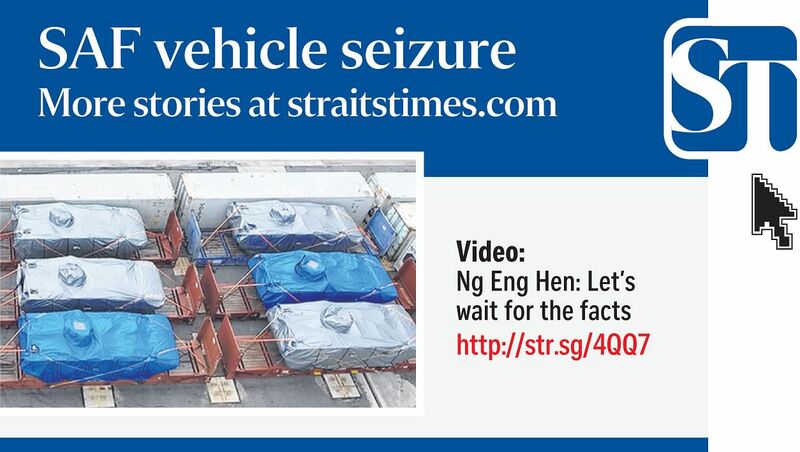 Yesterday, Dr Ng said the Terrex vehicles were taken off the ship in Hong Kong after Hong Kong Customs officials "raised queries with regard to full compliance" by APL. There should not be speculation on why the armoured vehicles were detained, he added. "Until the facts are established, any speculation is premature, unwarranted and I think indeed unfair to the Hong Kong authorities or any other countries."